The beginning of a new year is a fresh start! It is the perfect time to take an assessment of your health and happiness and take action to make things better. Many of us find that we have a lot a room for improvement, but it can be hard to know where to start. 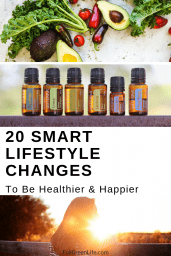 This list of healthy lifestyle changes has you covered and will give you some inspiration and direction for a healthier New Year! Drink enough water. Good hydration helps flush toxins from our bodies, keeps our cells healthy, and aids in proper digestion, just to name a few benefits. Most sources recommend at least 48-64 ounces of water each day. The number is highly individual, though, depending on your gender, activity level, and other factors like pregnancy/breastfeeding. Find a physical activity that you enjoy. We all know physical activity is important for maintaining a healthy weight as well as keeping our bodies strong. But there is no reason why physical activity should be a chore. Make it a priority this year to find something that is fun that will move your body. Maybe it’s hiking, golfing, tennis, water aerobics, or Zumba. If you enjoy it, you will look forward to it. Focus on gratitude. Deliberately taking the time to appreciate even the little things in life can lead to a more positive outlook on everything. I’ve personally found that it has helped me have a “cup half full” attitude rather than “cup half empty.” Start a gratitude journal this year to keep yourself accountable and on track with your new grateful mindset. Eat fresh fruits and vegetables every day. Are you getting enough of nature’s vitamins? Active women are supposed to eat at least 3 servings of fruit a day and 4 servings of vegetables a day. Give grace to others. Give the rude driver the benefit of the doubt. Maybe he is having the worst day of his life. Respond with compassion instead of judgment to the mom whose child is throwing a tantrum in front of you in line at Target. It’s just not worth it to spend negative energy on these situations. Buy a reusable stainless steel water bottle. We all have heard by now about the dangers of BPA and other chemicals in plastics. Invest in a good quality reusable water bottle if you haven’t already. This eliminates any possibility of consuming toxins leached from plastic into your water. Schedule time to relax and unplug. Having downtime is essential for stress levels and your mental health. Allow yourself some scheduled time for quiet and not being busy or staring at a screen. I love this TED Talk that highlights the importance of having “negative space” in your day. Check it out (but not during your unplugged time)! It’s a quick one…only 3 1/2 mins. TedxBoulder | Grant Blakeman on Minimalism for a More Full Life. Opt for glass jarred convenience foods over plastic jarred or canned. Many canned foods still have BPA in the lining of the can. You can avoid this risk altogether by purchasing products packaged in glass jars instead. Let go of what doesn’t make you happy. Whether it’s a toxic relationship, an unhealthy work environment, or your own bad habit that you want to change, take the steps to get it out of your life! You are better than that! Incorporate essential oils into your daily home life to replace toxic products. From DIY cleaning products and room spray to personal care products and natural remedies, essential oils can be used in many different products to replace hormone-disrupting artificial fragrances and chemicals, making your home a healthier, safer space. Prioritize your sleep. As adults, we still need our sleep. At least 7-9 hours is the recommended amount. Even though most of us know this, we still don’t get it. Considering that not getting enough sleep is linked to a plethora of health problems including high blood pressure, obesity, and heart disease, make it a priority to get yourself to bed on time. Consider it an investment in healthier years to come. Commit to a date with a friend on a regular basis. Any busy moms, introverts, or workaholics out there, this one’s for you. We all need human connection, whether it’s easy and convenient or not. Try to make either a standing lunch date with a friend, a regular playdate schedule with a kid whose mom you like, or get a friend to meet you at the gym for your favorite class and get coffee after. Whatever you have to do to make sure you are getting regular social interaction, it is worth the effort. Go organic for the “dirty dozen.” The extra cost of buying organic is discouraging for alot of us. If you don’t buy all organic, at least start with the dirty dozen. These fruits and vegetables have the highest concentration of pesticides and other harmful chemicals within the part of the fruit or vegetable that we eat. The list includes strawberries, spinach, nectarines, apples, grapes, peaches, cherries, pears, tomatoes, celery, potatoes, and bell peppers. For more info, check out EWG’s Guide to Pesticides in Produce. Pick up a long lost hobby. Reconnecting with your pre-kids self can be incredibly fulfilling and really help increase your enjoyment of life. Maybe you love running, or scuba diving, or sewing, or playing a musical instrument. If there’s something that you used to love but has become lost along the way, why not pick it back up? Spend at least ten minutes every day in the sunshine. Since your body uses sun exposure to produce vitamin D, you’ll be taking a step toward preventing that common deficiency. In addition, getting outdoors in the sunshine and connecting with nature is believed to boost levels of serotonin in the brain. Declare one day a week “meatless.” If that is not realistic for you, cut down on your red meat intake. I find that when I make a meal without meat, I typically end up increasing the amount of veggies that go into the meal. It’s an easy way to boost my family’s intake of that important food group. And red meat, compared to poultry and fish, typically has high levels of saturated fat. Cutting back on the number of days you consume red meat is another alternative for a healthy food change. Start making your own cleaning products. Traditional cleaners like bleach and cleaners with ammonia have dangerous chemicals in them that are easy to avoid if you make your own. You’ll also save a ton of money. For inspiration, take a look at DIY Green Cleaning Ingredients To Get You Started, Nontoxic Surface Spray, and 4 Safe & Nontoxic Ways To Clean Your Windows. Incorporate 5 minutes of yoga, meditation, or deep breathing into your morning or nightly routine. Any of these added to your daily routine will work wonders for your stress level and help you feel more centered throughout the day. Address your mental health. If your relationships are being affected by constantly feeling overwhelmed, anxious, or low, don’t be afraid to talk to your doctor. All of these things are super common for women in this over-scheduled world we live in. There are many lifestyle changes, medicines, and alternative medicine options out there that will help. Find ways to give to others. This might be befriending a lonely neighbor, volunteering at a shelter, or getting involved in a local non-profit with a mission that means a lot to you. Big or small, acts of kindness and giving your time and caring helps other people who really need it. And it will make you feel good, too. Make Some Healthy Changes, Starting Now! 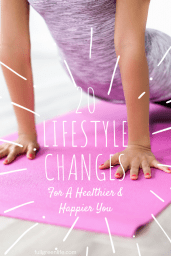 I hope this list has inspired you with ways to make some positive changes to your lifestyle! What other ways are you hoping to start a healthier, happier way of living this year? Let me know in the comments below. I’d love the inspiration, too!